After the U.N. voted to grant the Palestinians observer state status, Israel announced its intention to move forward with plans for construction in the so-called E1 corridor between Jerusalem and Ma’aleh Adumim. Ever since, news stories and opinion articles about the Israeli decision deluged the public with dire claims: The E1 corridor will bisect the West Bank. It will block access to Jerusalem from Palestinian cities. It will prevent establishment of a viable and contiguous Palestinian state. It will destroy all chances of a two-state solution to the Palestinian-Israeli conflict. According to the Society of Professional Journalists, reporters are expected to “test the accuracy of information from all sources.” This is especially true when citing such extreme claims. 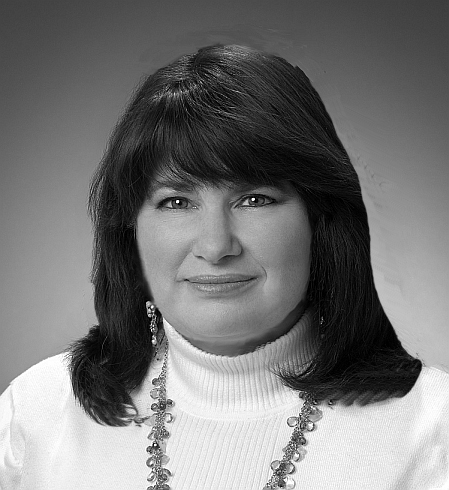 Readers depend on journalists to do more than just regurgitate partisan sound bytes. They rely on them to challenge, probe, and ask questions. Palestinian contiguity in the West Bank would not be cut off with construction in the E-1 corridor. The American Heritage Dictionary defines contiguous as continuous without a break or a continuous connection. Regarding Israel and the West Bank, the concept and interpretation of contiguity is best understood by examining a map of the area. 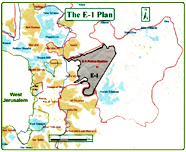 On the above map, an arrow points to a blue mark indicating the rough location of the proposed E1 corridor between Jerusalem and Maaleh Adumim. This corridor sits within the proposed route of the security barrier encircling Ma’aleh Adumim and Jerusalem, indicated with a pink and purple line. The purple line shows the section of the security barrier that is already built and the pink line shows the section not yet built and subject to revision. The construction of homes would take place in a small subsection of E1. The green line indicates a route between northern and southern West Bank cities that lies outside E1 and the territory that might be encompassed by the proposed security barrier. Those who charge that Israeli building west of Ma’aleh Adumim severs north-south contiguity disregard the fact that the northern and southern parts of the West Bank are connected by land east of Ma’aleh Adumim (marked on the map) that is at its narrowest point also about 15 km wide. 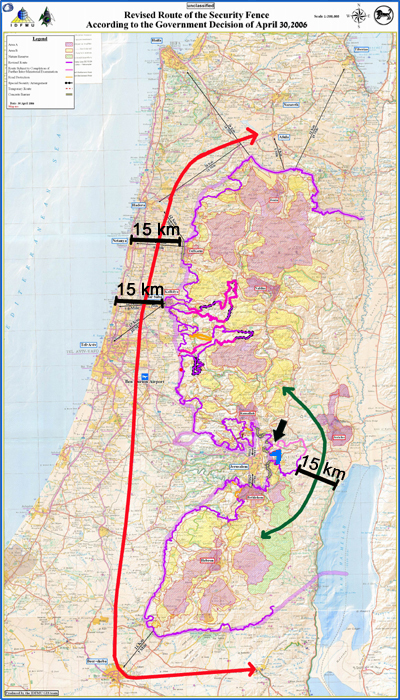 The red line indicates the circuitous route necessary to travel between northern and southern Israel (e.g. from Arad to Afula) in the pre-1967 boundaries. The narrow strip of land separating the “Green Line” (and the Security Fence) from the Mediterranean Sea also is about 15 km at it narrowest point — and extends for a much greater distance than the narrow strip in the West Bank. Close up of E-1 within possible route of security barrier. Moreover, if the E1 corridor is not built, the Israeli town of Ma’aleh Adumim — which almost all agree will be annexed (including previous peace negotiators) — would become an island, without a land bridge to the rest of Israel. To Israel’s critics, however, such contiguity for Israel is unnecessary and undesirable. Under a final agreement, neither Israel nor a Palestinian state would need to be inconvenienced by longer, more circuitous drives between cities. Both could have direct access to their cities under roads and access agreements decided upon by both parties. Palestinian access to Jerusalem is not contingent on the E1 corridor. That small area lies to the east of Jerusalem. There are other more direct ways to access the city, subject to final status agreement on Jerusalem. Bethlehem, for example, is south of the city and Ramallah is north. Travelers from both cities would be taking a more circuitous route were they to access Jerusalem through the E1 corridor. 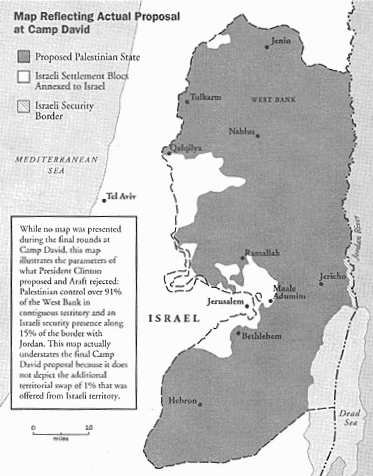 The following map represents former U.S. President Bill Clinton’s peace proposal during the 2000 Camp David negotiations. It is from the book, The Missing Peace, by chief U.S. negotiator Dennis Ross. The map clearly shows the E-1 area under Israeli control and a contiguous Palestinian state in the West Bank. a double standard in what is considered “contiguity” for Palestinians and for Israelis. Were Israel to return to its pre-1967 boundaries, as most critics of Israel’s E-1 plan advocate, the country would be no more contiguous than the West Bank: Before 1967, southern and northern Israel were connected by a long strip of land that was about 15 km at its narrow points. While Israel’s critics view this as acceptable contiguity for a viable, Jewish state, they consider it unacceptable for Palestinians. 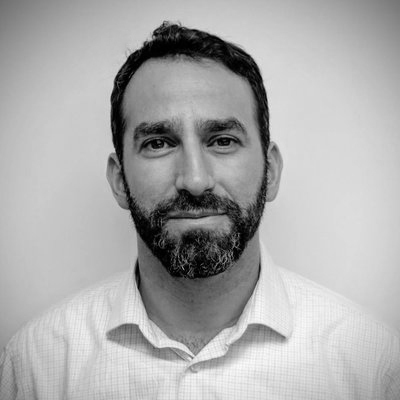 While development of E-1 might not fulfil every Palestinian demand about the contours of its future state, and while it might have an impact on the two side’s conflicting claims on Jerusalem, it certainly does not prevent a contiguous Palestinian state, and it certainly does not prevent a viable Palestinian state.